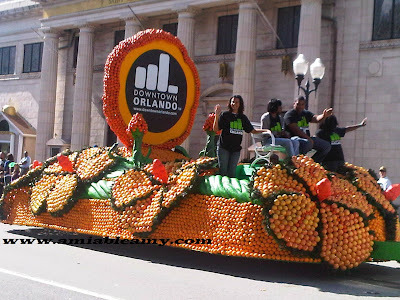 On December 31,2011, my husband and I were at Downtown watching the Fresh from Florida Parade formerly known as Orlando Citrus Parade. 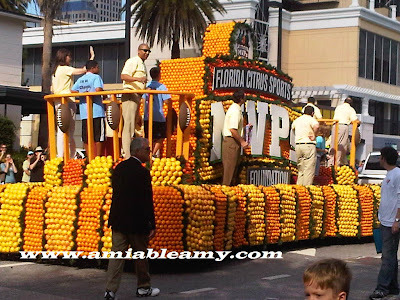 This parade is done annually and served as the kick-off of the College Football Bowl events which are the Champs Sports Bowl and the Capital One Bowl. These pictures were taken nearby Lake Eola in Downtown Orlando. There were only few well decorated floats on this parade but, I am telling you, these are the nicest and beautiful ones. These are real fresh oranges, tangerines and citrus which are produce from Florida. 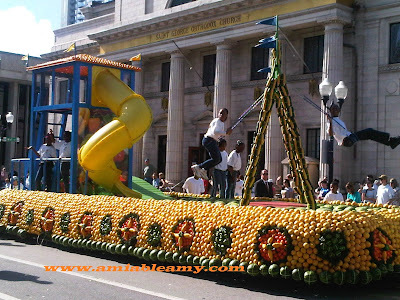 The float below is interesting but, I thought it would look more nicer if they covered the boat with oranges. All good though. 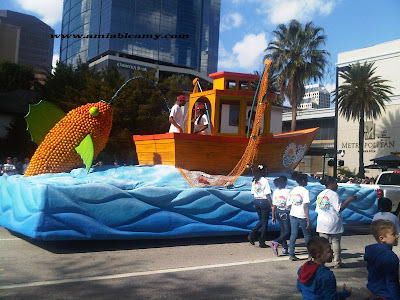 I hope that the 2012 Fresh from Florida Parade will be more exciting, fun and would truly amazed the Floridians as well as the guests. Well, if there is a Fresh from Florida Parade by 2012, it would mean the Mayan "12-21-2012" is a hoax Doomsday prediction, right?